Some areas in Namibia carry Malaria risk, therefore prophylaxis may be necessary. Consult your doctor for more information. If you have all of the correct/ necessary documents with you when crossing at a border post you should have no trouble with the officials. Please note, Namibian officials are not open to bribery. Please take off your hat and sunglasses upon entry of the border post building(s) and remember to be patient at all times. Currency: The Namibia Dollar (N$) is fixed to and equals the SA Rand. The South African Rand is also legal tender. Foreign currency, International Visa, Master Card, American Express and Diners Club credit cards are accepted. Most tap water is purified and safe to drink. Veterinary Fences are set up throughout Namibia, Botswana and Zimbabwe. It is generally not allowed to bring things like meat, milk products, skins, etc. across those fences. This is especially the case when entering Botswana from Namibia. Within Namibia it is allowed to bring those products from South to North through the fence, but not vice versa. There are exceptions for Botswana with regard to private consumption, however, these are frequently overruled by disease outbreaks and thus not applicable. Checks are frequent and everything that does not comply with the regulations will be confiscated. Tipping is not compulsory in Namibia, however, it is recommended for different areas of life and even expected in some. The following should give a broad overview. A satellite phone, just like a GPS, is only needed in remote areas of Namibia, Botswana, Zimbabwe and Zambia. Along major roads and in towns you have normal reception. 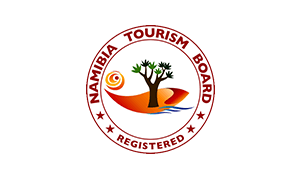 In order to enter any state-owned conservation area in Namibia a Permit is required. It refers to an authorization paper to enter a specific area in the country. All permits are issued by the Ministry of Environment & Tourism only. 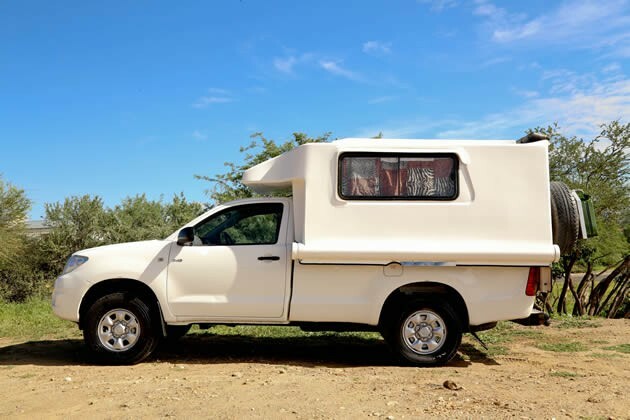 This is often confusing, as travelers think that they can get a permit also with Namibia Wildlife Resorts, however, NWR is only the public operator of different accommodation establishments in the parks. It has nothing to do with permits whatsoever. 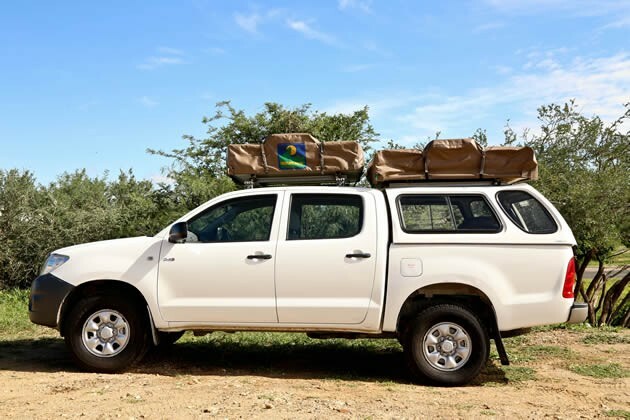 For Mudumu and Nkasa Rupara (Mamili) National Park as well as Bwabwata and Khaudum National Parks you get the Permit at the closest ranger station to the park’s entrance. The Namibia Dollar (N$ or NAD) is the only legal tender in Namibia. However, the South African Rand (R or ZAR) is also an accepted mean of payment throughout Namibia. The exchange rate is 1:1. Foreign Exchange legislation is very strict and thus it can take an hour or more to change cash into Namibia Dollar at a Bank. The worst exchange rate you will get trying to get Namibia Dollar or Rand in your home country! Rather draw from an ATM which can be found throughout the country. Use those that have a security guard on site. All four major banks (Bank Windhoek, Standard Bank Namibia, FNB Namibia, and Nedbank Namibia) accept MasterCard and VISA as well as their respective debit card sister companies like Maestro or VISA Electron. Daily or withdrawal maximum is between N$ 500 and N$ 4000, depending on bank, card as well as your home bank. Namibia is a perfect country to explore Africa as a self-driving traveler. Roads are well maintained, regulations follow international standards and road signs are put at every important point. It is therefore straight forward to find the right way through Namibia. Make use of a GPS if you plan on travelling in the more remote areas of the country. The best software to use with your GPS is called Tracks4Africa and it is available for a few Euros by download. In Namibia traffic drives on the left hand site of the road, just like in all the neighboring countries except for Angola. It is compulsory to wear safety belts at all times. It is not recommended to take hitch-hikers in your vehicle. The speed limit in urban areas is 60 km/h (sometimes 80 km/h on major roads), 100 km/h on unpaved rural roads and 120 km/h on paved rural roads. 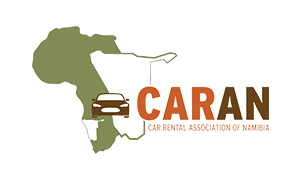 Car rental companies generally set a much lower allowed speed in the contracts (70–80 on gravel and 90–100 on tar). Outside of schools the speed limit in towns is 40 km/h. Outside larger towns along main highways you will generally have to stop at permanently set-up police checkpoints. Stop at the stop-sign (not the stopping line) even if you do not see any police around or even if it is darkest night. In 90 % of the cases the police will wave you through, however, from time to time they check driver’s licenses and the registration of your vehicle. Always be friendly and polite… a smiling “Good Morning” or “Good Day” might help. Traffic fines in Namibia are high and they were doubled at the end of 2010. For example: If you are caught talking on the cellphone while driving, you will be fined N$ 2000 (approx. € 140). Fines have to be paid within 7 days at the nearest Police station in the town that they were issued. No bribery is allowed. It is important to have your International Driver’s License with you together with your national driver’s license! Car rental companies might not ask for your International one, however, the police and an insurance company will ask for one in cases of an accident. Due to the long distances, and the cost of construction and maintenance, only Namibia’s main arteries are ‘sealed’ – which means they have a tarred surface. However, in our experience the tar roads that do exist are usually in good condition. These roads are comparable to British A roads, American secondary highways or French routes nationales. They are almost all single carriageway, but they will sometimes widen up steeper hills, to allow overtaking of slow-moving vehicles. Outside of the towns, where the national speed limit of 120kph (75mph) usually applies; these roads often have long, straight sections. A confident driver can average 100kph (62mph) on these roads. Namibia’s tar roads connect its main cities, and link to its ports and neighboring countries, so it’s on these roads that you’re most likely to encounter large trucks. Although truck drivers will sometimes use their indicators to let you know when overtaking is safe, we recommend that you only overtake when you can actually see that it is safe. So be prepared to sit behind these until you reach a suitable spot. The other hazards to be aware of on tar roads are livestock and game. While most of these roads have a very wide verge, and sometimes the land beyond is fenced off, wild animals and livestock do occasionally wander out onto the road. 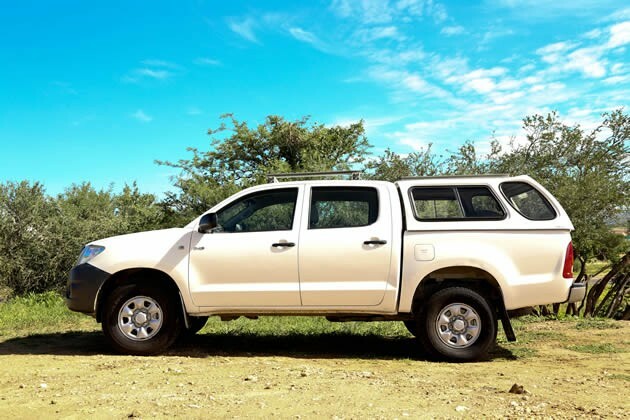 The majority of roads in Namibia are gravel, which varies from coarse gravel to fine sand and dust. The condition of these roads is generally very good and there is a continuous effort by the roads authority to maintain them. Most visitors will see at least a few ‘graders’ at work during a self-drive trip around the country. 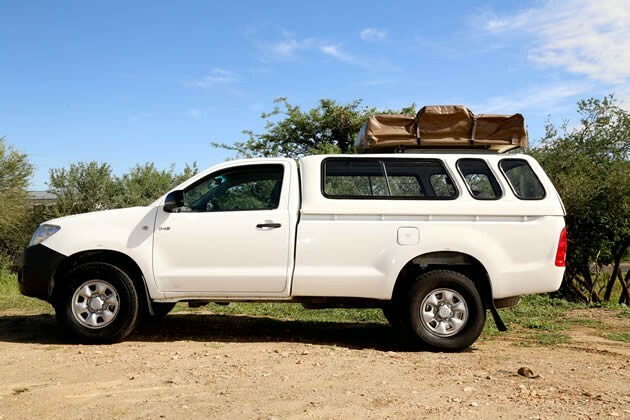 Having said this, in any trip you’ll come across sections of gravel roads – generally those which are about to be graded – where the surface is potholed and/or corrugated. Sometimes these appear quickly, with little or no warning, the best advice we can give here is to slow down. 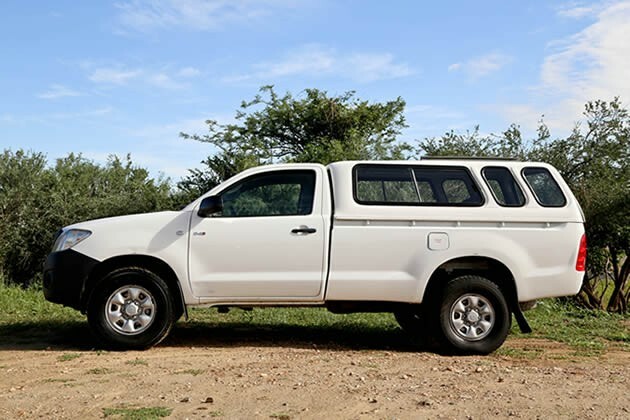 Namibia’s gravel roads are generally in good order but we’d always recommend that drivers stick to an absolute maximum speed of 80kph (50mph) – and that this is reduced in sections where the surface isn’t as good. Most gravel roads are easily wide enough for two vehicles to pass, but it’s always wise to slow down when passing another vehicle, for two reasons. First, you may encounter flying stones, which can damage your rental vehicle if they hit at speed. Second, immediately after passing the other vehicle you’re likely to drive into a dust cloud, which can drastically reduce visibility. Namibia’s arid environment is veined with ephemeral rivers, many of which typically flow for only a few days a year. Roads that cross these do so mostly at fords, rather than bridges. These should always be approached with care. For rivers that flow more regularly, the riverbed is often concreted to prevent the road being washed away in flood, these concrete patches can be potholed and uneven. Where fords are simply dips in the gravel, the gradients can be unexpectedly steep, so crossing at speed can damage your rental car’s undercarriage. Namibia has a number of spectacular mountain passes that are well worth a detour, even though you will usually need to slow down to drive safely through these. Often the road will narrow for sections of these, and sometimes short parts of the pass will be tarred or even paved. Such sections may start with little or no warning (or perhaps a cattle grid) and end just as abruptly. The join between tar and gravel is often the worst part of the road in these passes, so approach them with caution. On private roads, including the driveways to some lodges – particularly those that slope – you may find a series of large bumps, similar to speed humps. These are designed to channel any flowing water off the road, helping to prevent the tracks being washed away in the rains. Salt roads are found exclusively by the coast and should be treated in much the same way as gravel roads. Their surface is a mixture of salt water, gypsum, sand and/or gravel that is then baked in the sun. The result often looks like broken or old tar roads, and while it isn’t loose, it can be bumpy. Furthermore if these roads are wet, such as after rain or in a heavy fog – which is a frequent occurrence near the coast – they can become slippery. Namibia has a well working cellular network reaching up to 95% of the population. By far the biggest providers are MTC and TN Mobile. MTC (Tango) and TN Mobile (Prepaid) do offer different prepaid solutions and pricing models as well as internet solutions. Prices do not vary a lot between the two major providers. You can buy a Starter Pack at any fuel station, Supermarkets or MTC shops. The starter pack is made up of a brief manual and a combined SIM card. The SIM card is activated automatically when it connects with the MTC network the first time. Airtime can be bought at street dealers, supermarkets, fuel stations, airtime vending machines, MTC shops etc. Generally fuel can be paid in cash only! Since September 2011 more and more petrol stations allowed paying fuel with credit cards. Fuel stations are also known as petrol stations, service stations, garages or diensstasies in Namibia. N$11.78 per liter for diesel 50ppm. Unsere Flotte aus Allrad-Mietfahrzeugen, kann für jedes Abenteuer ausgerüstet oder angepasst werden.